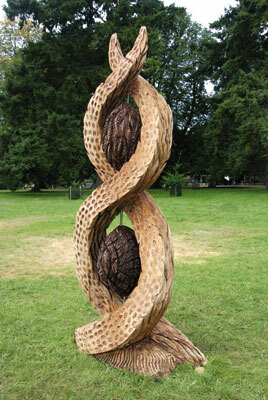 Chainsaw carvers hoping to take part in Sculptree, the August festival at Westonbirt Arboretum, have to submit their designs during January. 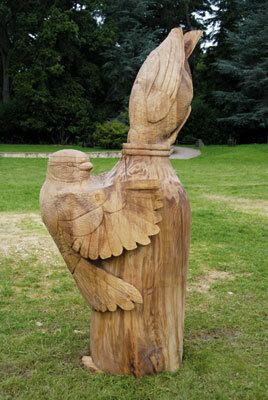 Only trees that are dead, damaged or dangerous are felled for this event and around April, the twelve carvers selected receive photographs and dimensions of the timber considered appropriate for their design. They do not actually see their timber until they arrive at the Arboretum on the Monday before August bank holiday weekend, when it might be possible to request an alternative piece if it is not considered suitable, but more probable that the design would be adapted. These are not pieces of timber that can be moved around in a wheelbarrow! They are massive sections of mature trees - this year oak (Quercus robur), beech (Fagus sylvatica) and cedar (Cedrus spp), needing heavy lifting vehicles and careful supervision to move them even a small distance. 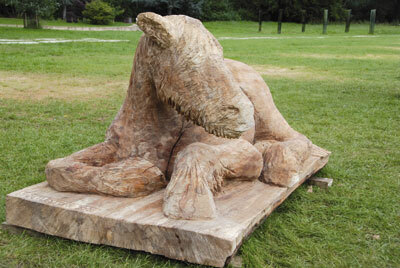 The carvers have seven days to complete their sculptures and on Bank Holiday Monday, the work is auctioned with part of the proceeds going to Tree Aid. These carvers work incredibly hard for a week, starting at about 8am every morning and often not finishing until it is nearly dark, taking the risk that at least two people will want their sculpture enough to fight over it at the auction and make it all worthwhile. 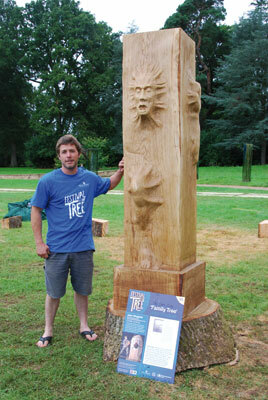 Daniel Cordell became interested in chainsaw carving when he visited Sculptree some twelve years ago and has now taken part in the event for six of the past seven years. A fine arts graduate from Loughborough University, he is a versatile professional sculptor working on any scale from small to monumental. He always submits original designs for Sculptree and likes the longer event that gives him time to develop the work without too much pressure. His smaller carvings, that are displayed in the Sculptree Gallery, are very popular and usually snapped up in the first couple of days of the weekend event. 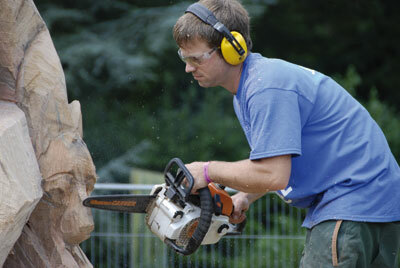 All carvers who use chainsaws in public need a minimum of the LANTRA certificate of attendance that shows they have attended a course on the use of a chainsaw, but most of the carvers at Sculptree have attended a NPTC (City & Guilds National Proficiency Test Council) course that is more comprehensive and culminates in a test. John Wingfield is a professional instructor for both these courses and, ordinarily, does not have much time for sculptural work. 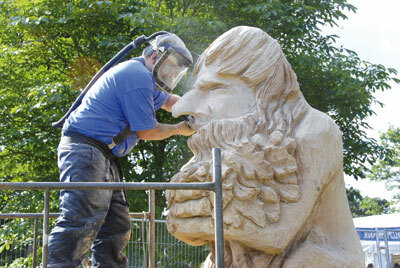 This is his second year as one of the Sculptree team and, as this is not his bread and butter work, is able to look on the week as something of a holiday, enjoying the company of other carvers and the social side of the event. This year John chose to use a carving gouge to create much of the detail of Frustration but found it hard work and more time consuming than the chainsaw. However it paid off as the body parts emerging from the timber were beautifully carved and the oak sculpture raised a respectable £2,500 at auction. First timer, Neil Sardeson, usually works on his own, carving wood sculptures for gardens and public places, so although delighted to be selected as one of the Sculptree team, he was a little apprehensive about working in close proximity to so many other carvers. His fears were groundless as he found a pleasant, friendly atmosphere with a helping hand from the other sculptors whenever it was needed. He was also relieved to find there was no competition between the carvers as whether or not their work did well at auction was really in the lap of the gods. He enjoyed the whole experience but found pacing his work a little daunting, being aware that the sculpture had to be finished on time, but also that visitors wanted to watch the carvers at work. In the end he was happy with the results and his Embrace in copper beech (Fagus sylvatica) sold for £2,600 at auction. As in 2007, there were three sculptors taking part for the first time, two who had been part of the event since it started, and the others with various years of participation between these extremes. This mix resulted in the usual fine selection of sculptures for sale in the auction with prices ranging between £1,200 and £3,500, and second smaller carvings selling from £250 to £1,050. 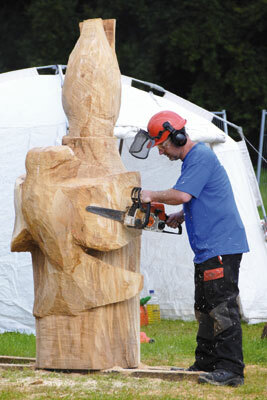 "The carvers have seven days to complete their sculptures"